President Obama takes the oath of office. He is the only President, other than FDR, who has taken the oath four times. Here’s why this day, this year, this inauguration is so exciting and special. When our first African-American President is sworn in for a second term he will acknowledge several important historic events and ideals converging. The alignment is amazing. 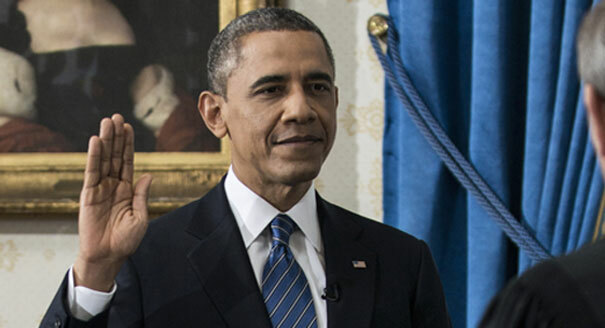 President Obama will be sworn in on two Bibles: one that was once owned by Rev. Martin Luther King Jr. will sit on top of another previously owned by President Abraham Lincoln. This year is 150 years since the signing of the Emancipation Proclamation by President Lincoln which freed the slaves in the Confederate States and Territories (January 1, 1863). This year is 50 years since Rev. King led his historic March on Washington for Jobs and Freedom where he delivered the “I Have A Dream” speech (August 28, 1963). Today, the third Monday in January, is usually set aside to celebrate the National Holiday of Dr. King’s Birthday. Next month is the 100 anniversary of the birth of Rosa Parks (February 4, 1913). One of the marching bands participating in the parade today comes from Little Rock Central High School. In 1957, LRCHS became the focal point for enforcing the 1954 Integration Ruling by the Supreme Court. On the morning of September 23, 1957 nine African-American students were met by an angry mob of 1,000 white protesters denying them entry into the school. Once a poster child for segregation, today Little Rock’s band will feature students of African, Asian, European, Hispanic, and Native American ancestry. Although the crowd is predicted to be less than half of what it was in 2009, that’s really the wrong way to measure the events of today. The actions of this day will be a direct link through the lives of thousands of Americans: to their blood, sweat, and sacrifice reaching all the way back to Crispus Attucks, the first martyr of the American Revolution. Today, the actions of the Great Emancipator, the seamstress who sat down to stand up and the King Who Dreamed will all be affirmed when Barack Hussein Obama takes the oath of office for a second time. We may not be a perfect country. We might be divided on many issues. However, we can all take satisfaction in the notion that, as Dr. King said, “The moral arc of the universe is long, but it bends toward justice.” That is a comforting thought.